I have always liked this sampler... the chart by Threads of Gold has been around forever... there are no dates on our packages... but the design remains lovely as it did in 1811 when it was originally stitched by 13yr old Lucy Dunning. The border is gorgeous, and the octagonal cartouches in the center band really draw your eye. They are worked over one in half (tent) stitches. 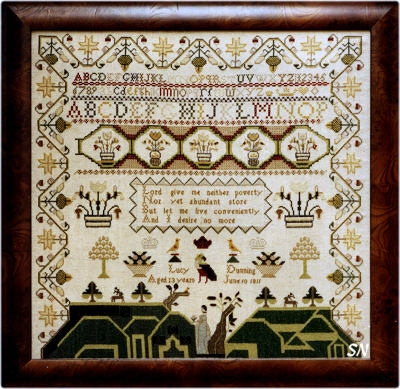 Although the green grasses as the bottom are all Cross Stitched... you could add Satins to that if you wanted. Throw in some Sawtooth Satins around the verse, a few Algerian Eyes up in the alphabet... this is just so pretty! Stitch count is approx 290 square, so it'll be a commanding 18 x 18 on 32ct, and a delightful 14-1/2 inches on 40ct. 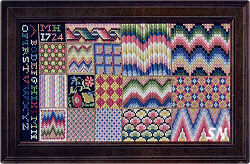 Offered as a chart, it is coded for DMC or silks.